Compile using RPG IV code. See Note 1. Specifies that each program is to be compiled using RPG IV code, then bound as a single module ILE type program. Activates the second level of ILE implementation. That will bind any GUI and multilingual program into the function program and use supplied service programs to dynamically call (CALLB) LANSA internal programs. Indicates that the conversion option *DATETIME is to be used when OTHER file I/O modules are compiled. This allows date (L), time (T) and timestamp (Z) fields to be accessible in LANSA. Indicates that the conversion option *VARCHAR is to be used when OTHER file I/O modules are compiled. This allows variable length (VARLEN or varchar) fields to be accessible in LANSA. Note that this setting does not allow variable length character fields to be used as keys within LANSA. If the physical file or any logical views made known to LANSA have a varchar field as a key, the I/O module will fail to compile. Indicates that all I/O modules created by LANSA are to have USEADPAUT(*NO). That is, do not use program adopted authority for I/O modules. Corresponding to system flag *IOMXSERVER. See Note 2. It is recommended that you set the full list of values *IOMXSERVER, *IOMBLOCKBYKEY and *IOMBLOCKBYRRN into data area DC@OSVEROP as a system default for all LANSA systems. Corresponding to system flag *IOMBLOCKBYKEY. See Note 2. Use this option to indicate that I/O modules should be compiled to support high speed record blocking in physical file key order. You must use this option when using LANSA/Client. You must use this option when using the LANSA/ Server *BLOCKBYRRNnnnn selection option or the "receive immediate" option. You must use *IOMXSERVER if you use this option. Corresponding to system flag * IOMBLOCKBYRRN. See Note 2. Use this option to indicate that I/O modules should be compiled to support high speed record blocking in relative record number order. You must use this option when using LANSA/Client. You must use this option when using the LANSA/ Server *BLOCKBYRRNnnnn selection option or the "receive immediate" option. You must use *IOMXSERVER if you use this option. 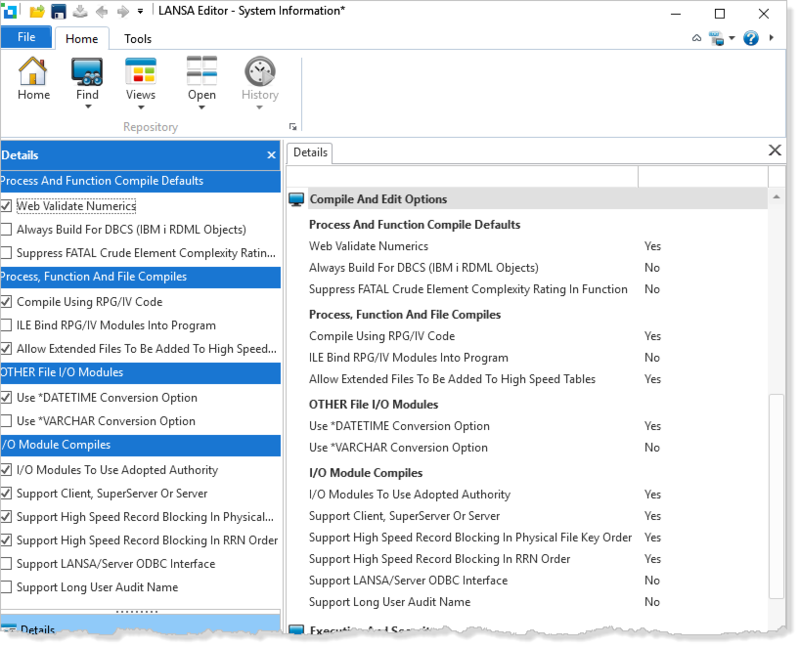 Use this option to indicate that I/O modules should be compiled to allow support of the LANSA Open ODBC Interface. You must use *IOMXSERVER if you use this option. Corresponding to system flag *HSTABEXTEND. Allows database files with record lengths up to 1988 bytes to be added to a user index for high speed lookup. Warning: Refer to Database File Attributes in Files in the LANSA for i User Guide before using this option. Warning: It is strongly recommended that if option *HSTABEXTEND is added to system data area DC@OSVEROP to make the extended entry record length available, or is removed to limit entry length, that all files tagged as high speed tables, all read only functions that use these files and all other I/O modules and Dboptimized functions that use high speed tables for lookup validation rules be recompiled AFTER deleting the current user index which is DC@TBLIDX if adding *HSTABEXTEND, DC@TBLIDY if removing *HSTABEXTEND. Indicates that a function that would cause the "Crude Element Complexity Rating" to return a FATAL will cause a WARNING only. It is not recommended to use this setting as the function may subsequently fail to compile. RPGIV and ILE: Before you attempt to use any of the RPGIV and ILE related switches, it is strongly recommended that you first read ILE Implementation in the LANSA for i User Guide. If you have grossly exceeded the recommended limits for the number of logical views created (or made known to LANSA) then you may find that an existing I/O module may not (re)compile when these options are used. If you have grossly exceeded the recommended number of real or virtual fields in a physical file then you may find that an existing I/O module may not (re)compile after these options are used. In either case, temporarily remove the options from data area DC@OSVEROP while recompiling the I/O module that is experiencing the problem. Also note that RPG IV (V3 version of RPG from IBM) has removed the total file, total static initialized storage and total subroutine limits that may be causing such problems to occur. *IOMXSERVER, *IOMBLOCKBYKEY, *IOMBLOCKBYRRN and *ODBC increase the number of files declared in an I/O module, the amount of static (literal initialized) storage used by an I/O module and the number of subroutines in an I/O module. Note also that if either *IOMBLOCKBYKEY, *IOMBLOCKBYRRN or *ODBC are specified, *IOMXSERVER must also be specified.